The Jelawang jungle in Kelantan offers a variety of trekking opportunities and different level of comforts. At the “entrance” to the jungle is the Perdana Stong Hill Resort and an hour of uphill trek through leech-infested ground is the Baha’s campsite. Around the area, waterfalls and several mountains to suit the different interest of the trekkers. Caving is also available near to the Dabong Railway station. 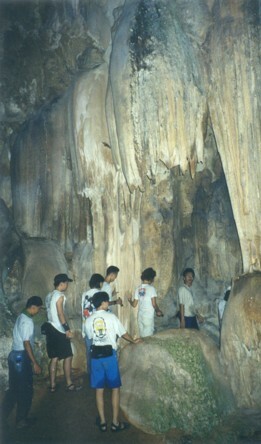 A trip to the caves can be arranged with the guides. 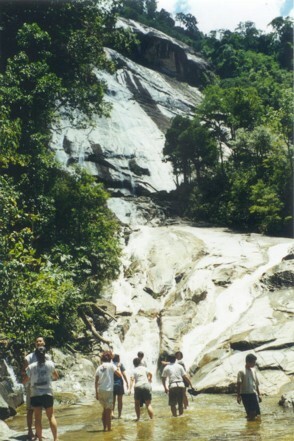 The many treks available meant that visitors would not be bored when they visit the Jelawang jungle. To start with, there are 4 caves (Gua Ikan, Gua Kris, Gua Pagar, Gua Gelap) near the railway station where you can explore. The caves are still relatively clean and the structures intact but with further human intrusions and lack of control, it is just a matter of time the condition of the caves deteriorate. Other than the Jelawang waterfall, which is claimed to be the highest in South East Asia at a height of 305m, there are also several smaller ones along the stream. The stream, with its many pools and potholes, is a great playground for people who love mountain streams. Apart from the three most commonly climbed mountains mentioned above, there are six others that can be found in the region. For those who want to take up the challenge, it is possible to climb all nine mountains in a week. The Perdana Stong Hill Resort offers visitors with the comfort of the city while the Baha’s campsite is the ideal campsite for the more rugged. The Perdana Stong Hill Resort is located at the foot of the Stong waterfall. The area is well maintained and the rooms are clean. Visitors can take a short walk to the waterfall to enjoy the cool mountain water from their chalets. Far away from the busy cities, this is a very good place to relax. The Baha’s campsite is located at the top of the Jelawang waterfall. This is where most of the guides stay during the trekking season. There are a few huts, toilets and a shelter built by the guides from the Baha’s Adventure Team. As the campsite is situated just beside the stream, water is easily available and the shelter equipped with tables and chairs is a good place to consume your meals. Just a few minutes walk to the back of the campsite is another waterfall with a deep pool, which is the ideal place to bath and swim in. The guides there are the best I have met in West Malaysia. They are very friendly and as most of the guides can speak English, there is no problem with communication. The guides have a good knowledge of the wildlife that can be found there and they often share them with the trekkers. Although there are many plus points for visiting the Jelawang jungle, there are still some things that make it less ideal. Along the lower treks, there are leeches that welcome anyone who enter its “country”. 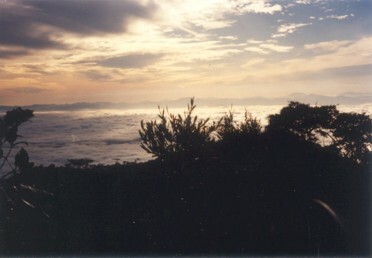 The summit view may not be very spectacular on some of the mountains due to presence of trees that block the scenery although the undergrowth is sparse. It may not be a good idea to visit it during the monsoon season due to the dangers of flash flood when it rains. Thus always listen to the instructions of the guides. Jelawang jungle offers one of the best treks in the country. It is best to visit the place now, as the place is still very clean and affordable. With its variety of treks, good accommodation and more importantly, superb guides, it promised to be an enjoyable trip for anyone who is going. One would strongly recommend this place for anyone who wanted to get away from the city and who do not mind getting a bit dirty. From Dabong railway station, the guide from Baha’s Adventure Team will take over. 10 Cave entrance Some part of the cave is so narrow that you have to crawl and squeeze through. 30 Entered a small cave opening to reach another cave called Cage Cave (Pagar Cave). 00 Main road outside train station Walk along main road straight ahead. 12 Other side of river Take van to Stong resort Pay only on the return trip. 43 Sungei Rantai Cross river. Have to climb up a steep part using a metal chain. Description of the attractions and the mountains in the region. I would like to thank Xuanhao and Faith for providing me with the updates on the details of the trek.